Home > Ex-Demo/Used > Used Desktop Magnifiers > Used Humanware Prodigi Desktop CCTV 20"
The image shows a woman in a purple sweater sat in front of the Prodigi screen, both seen in profile. 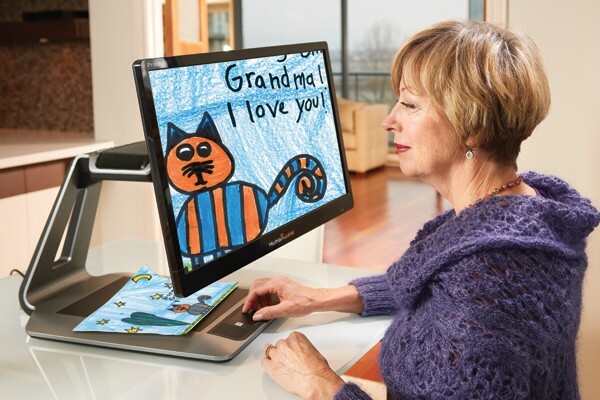 On the Prodigi screen can be seen an image of a cat drawn in colorful crayon. Used Humanware Prodigi Desktop CCTV 20"
The Prodigi Desktop is the first Personal Vision Assistant with Touch and Tap controls and Diamond Edge Text. With magnification from 1.2x to 20x, users can select from a wide variety of enhanced contrast options with Touch and Tap™ controls on a 20" LCD screen.